Your bulk buy offer is 1 case. How many individual packs of tissues is this? 1 case has 30 packs. Each pack has 10 individual packets. Therefore, 1 case would be 300 individual packets of tissues. Easily distributed throughout your entire workforce, our Proform Pocket Tissue packs are an economic choice. 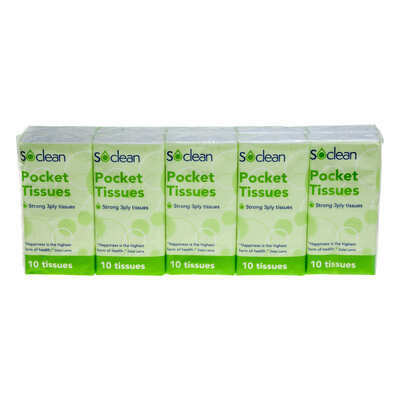 Developed to challenge the market leaders, each of these 10 packs features super soft 3ply tissues. They are strong and absorbent with a limited risk of causing skin irritations. Great for mopping up spills, wiping faces and for general cleaning, these compact packs fit easily into your pocket or handbag ensuring you're ready for any task. Our Tissues collection has a wide range of products on offer from our Facial Tissues through to Mansize tissues and even our Union Jack Tissue Boxes - and all at economic, wholesale prices.